As seen in House Beautiful mag Nov 2107 - Historic Home w Amazing River Views! Recently renovated by interior architect and designer in 2015, this home enjoys amazing views of the Hudson River from the charming historic village of Catskill NY. 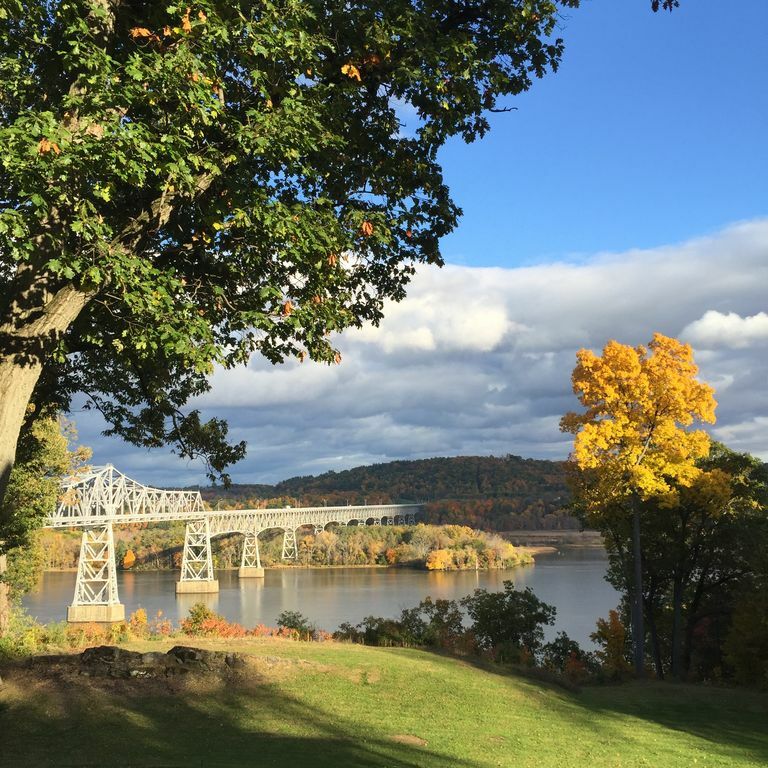 Located only 2 hours away from NYC by car or train and 7 mins from the hip town of Hudson NY with its award wining restaurants, galleries, shops, antiques, bars and year round events. Minutes from legendary hiking trails in the Catskills Mountains. Eclectic interiors full of interesting art, original details and comfortable clean new furnishings. Elegant and comfortable. 4 Bedrooms including a fantastic very large master bedroom and bathroom with balcony. Sleeps 7-9 people. Check our bed/room setup. Extra large kitchen with 16 ft long island that seats 8 overlooking the 3 acre estate, river and mountains. Ever changing landscape where you can catch a bald eagle, a flock of geese or a huge river barge crossing the Rip Van Winkle bridge. Private but not too secluded. Enjoy the country side and feel free to enjoy the many social or natural activities available in one of the most beautiful regions in the Nation. Perfect to build new unforgettable memories with your family and friends or for a romantic getaway. Architectural designer with a passion for old homes. Our weekend home is ideally situated in an extraordinary position between the Hudson Valley and the Catskill Mountains. Unrivaled interior design and views to Olana and the mighty Hudson River. Private but not isolated. Proximity to the hip town of Hudson NY and all its restaurants, bars, galleries and Amtrak station (2 hours from Penn Station in Manhattan). New renovation. Brand new appliances and amenities. Ski mountains and nature trails very close-by. Central AC. Year round activities. In-ground pool coming soon! 30 min away by car. Hunter and Windham ski resorts. 3 private acres of land right on the Hudson River with awesome views of Olana and the Rip Van Winkle Bridge. SONOS available. Please download the app to use. Tennis / Ping-Pong table room - not heated in winter. Yoga mat. The app "Sonos" must be downloaded so you can play your own playlists from your smart phone. "Alexa" is also available to play anything at your request. Netflix available. Some DVDs can be found under the TV cabinet and can be watched in your laptop. One large, one medium - in garage. Hunter Mountain (20 min) has amazing zip lining year round. One of the best and longest lines in the world. Near the Largest Tidal Wetland park in the Hudson River "RamsHorn Livingston Sanctuary"
Located 7 min away by car from Hudson NY with all its hip amenities , wonderful international restaurants, art galleries, bars, a plethora of antique dealers and interesting shopping stores and year round events. Near Catskill Mountains - great hikes and nature trails to enjoy. Be surrounded by nature within the charming village of Catskill with its beautiful old homes and quaint main street.